Hi BMG, agree with the view expressed about the Canon. Didn't stop him , in his Board of Governors role, from diverting the funds raised by his parishioners from the Murph, Whiterock, Springhill and St James to add extensions to St Toms and extend its lifespan to build St Louise's, a school primarily attended by girls from his old parish. "Mother Teresa 123 Springhill Avenue"
"Catholic Church ‘forced Mother Teresa out of west Belfast' "
The Catholic Church drove a saint out of west Belfast, a nun has alleged in a controversial new television documentary. The Irish nun claims to have solved the mystery of why Mother Teresa, who is being made a saint by the Vatican, pulled her order of nuns out of Ballymurphy in the 1970s. 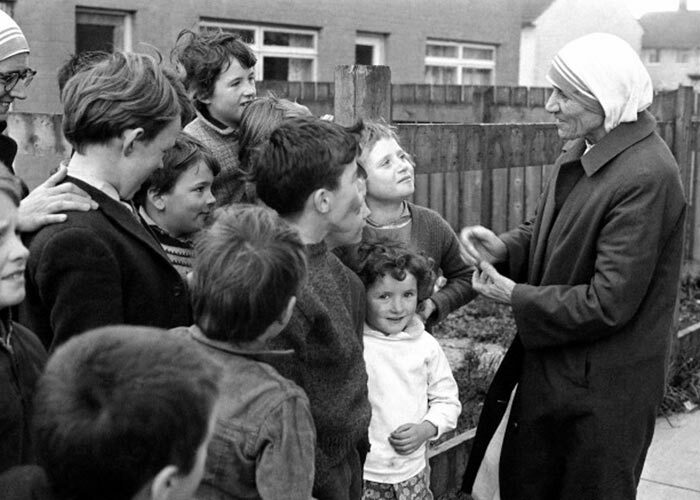 The Sisters of Charity order, founded by Mother Teresa, set up home in Springhill Avenue in Belfast at the height of the Troubles in October 1971. Just 18 months later the four nuns suddenly departed, to the surprise of residents. There were whispers the order was not welcomed and were forced out by a priest and bishop. Sister Eileen Sweeney, who visited the nuns’ Belfast home the day after they left, said she found a torn-up letter written by Mother Teresa which supports the view the nuns were pushed out. Mother Teresa then agreed to cover up the dispute with the Church for its sake and to prevent bad feeling in the community. Sister Sweeney, who is now in her 80s and lives in Dublin, said she pieced the letter together to keep as a memento of Mother Teresa but no longer has it. The programme suggests the parish priest, Canon Padraig Murphy, resented missionaries being sent to Belfast, believing that they should come from the city. "THE DAY I MET MOTHER TERESA"
An account by a Belfast born artist, of how, as a schoolboy, he met her in that area, during a shooting incident, and of how she ignored the shooting to come to his assistance. Could just be that after a while in Ballymurphy Mother Theresa decided the slums of Calcutta weren't so bad afterall. "Mother Teresa: Service held in west Belfast to mark canonisation"